SLCC's use of OER has saved more than 54,000 students over $4.6 million. 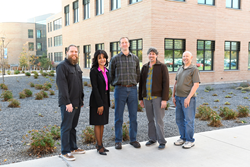 SLCC's faculty-led team Daniel Poole (l-r), Deidre Tyler, Jason Pickavance, Dan Carpenter and Tim Beagley. Anything you can do to help students save up front, every dollar you can save them, is incredibly beneficial. A faculty-led team at Salt Lake Community College received a 2017 OLC Digital Learning Innovation Award for advancing undergraduate student success through the adoption of digital courseware. SLCC’s team was one of three institutions and ten faculty-led teams selected from among 60 submissions in year two of the Online Learning Consortium’s (OLC) DLIAward competition. SLCC’s own initiative, Open SLCC, is nationally recognized as a leader in the use of open educational resources (OER), with over 1,400 sections that use OER instead of traditional, more costly textbooks. For students like physics major and full-time Salt Lake City firefighter Jeffrey Cunningham, OER has kept his conservatively estimated cost of $400 for textbooks while at SLCC from being much higher. “I think everyone has a horror story about paying $60 for a book, out of which the professor only uses one article,” said Cunningham, 34, whose dream job would be working for NASA after retiring someday from the fire department. He still owns a $300 calculus textbook from 2002 that he refused to sell back “out of spite” for a paltry offering of $30 – and, as it turned out, he has been able to use it again while going for his second bachelor’s degree. “Anything you can do to help students save up front, every dollar you can save them, is incredibly beneficial.” Having OER available at SLCC, he added, helps make choosing SLCC a “sound” financial decision. SLCC’s faculty-led team for Open SLCC includes sociology professors Daniel Poole and Deidre Tyler, biology professors Melissa Hardy, Dan Carpenter and Tim Beagley and Jason Pickavance, director of Faculty Development and Educational Initiatives. So far, they and others at SLCC have helped more than 54,000 students save over $4.6 million through the use of OER. The SLCC team accepted the DLIAward during the OLC Accelerate conference in Orlando. Many faculty members at SLCC have embraced a national nonprofit education technology initiative that gives students access to free peer-reviewed, openly licensed textbooks online or at a low cost in print format, collectively known as OER. More specifically, OER consists of teaching, learning and research resources that reside in the public domain or have been released under an intellectual property license that permits their free use and repurposing by others. DLIAwards were determined by two rounds of review, first by a team of institutional-level and higher education organization-level reviewers, who narrowed the field of submissions for final review by a national panel of judges.